Town of Nanton, Alberta (population 1,841) is located 94 km south of Calgary. A blue flag, a descending diagonal stripe with the name and overlain by a shield in red and white. Pioneers first settled in the Mosquito Creek Community (Nanton area) in the late 1800's and early 1900's. On June 22, 1903, a village was formed and named Nanton, after the late Sir Augustus Nanton (1860 - 1925). Sir Augustus Nanton was a partner in the financial firm, Osler, Hammond and Nanton, of Ontario. He was sent by the firm to the west to investigate investment in farm mortgages. Renowned for his sound judgment, he became a director for many companies, including the Canadian Pacific Railway, Hudson's Bay Company, Great West Life and the Dominion Bank. He arranged financing of the Calgary and Edmonton Railway, sold subsequently to the C.P.R. It was his close association with these two companies that led the community to name the village, "Nanton". Nanton was incorporated as a Town in the summer of 1907. The Nanton Family history dates back to the 1500's. The Town crest was recognized by the College of Arms, London, England, as a true crest of William Naunton, of Naunton Hall, Suffolk, England, in 1553. Another ancestor, Sire Robert Naunton, had the same Coat of Arms. He was a member of the Court of Queen Elizabeth I. Later, Naunton was the Secretary of State to King James I. 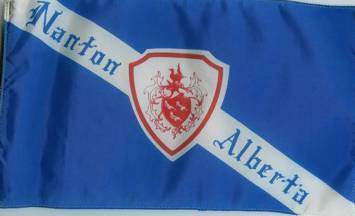 The Town of Nanton officially adopted the Nanton Coat of Arms in 1983, with the consent of the Nanton family. Some changes were required to allow the Town use of the crest as opposed to its use by a knight. The bird on top of the helmet is known as "Wyvern", a winged two-legged dragon with a barbed tail. On the shield below are three birds known as "Martlets", a Heraldic bird with no feet.